This is a pamphlet stitch hardbound book with separate spine. It is constructed of hand decorated and handmade paper except for the accordion in the center. I used Sobo glue and embroidery thread to put it all together. It contains poetry of spring and flowers written with both ink and gouache and is decorated with rubber stamps. 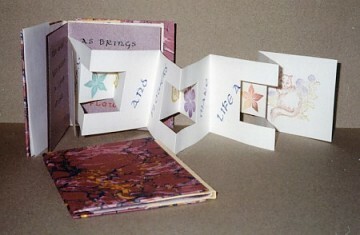 Book 4″ x 5¼″ (10.1cm x 13.3cm).